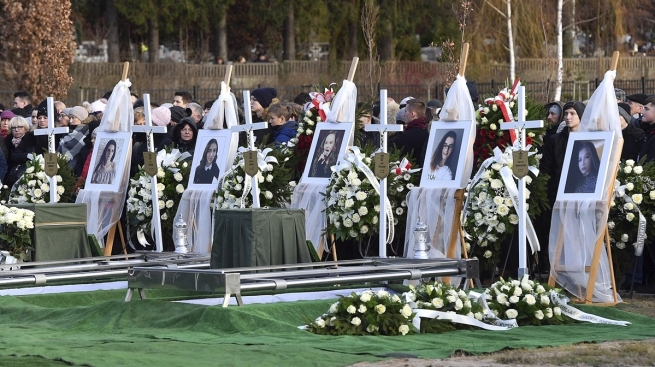 "They were together when their lives were ending, they are together here and they will rest together in the cemetery"
Pictures of five girls who died in an entertainment escape room fire last week, during their joint burial at a cemetery in Koszalin, northern Poland, on Thursday, Jan. 10, 2019. They died from carbon monoxide inhalation when a fire broke out next to the locked room where they were celebrating a birthday. Officials joined relatives and friends Thursday for the funeral of five teenage girls killed last week in a fire that broke out at a recreational escape room in northern Poland.